From afar, Saturn’s rings look like a solid, homogenous disk of material. But upon closer examination from Cassini, we see that there are varied structures in the rings at almost every scale imaginable. Structures in the rings can be caused by many things, but often times Saturn’s many moons are the culprits. 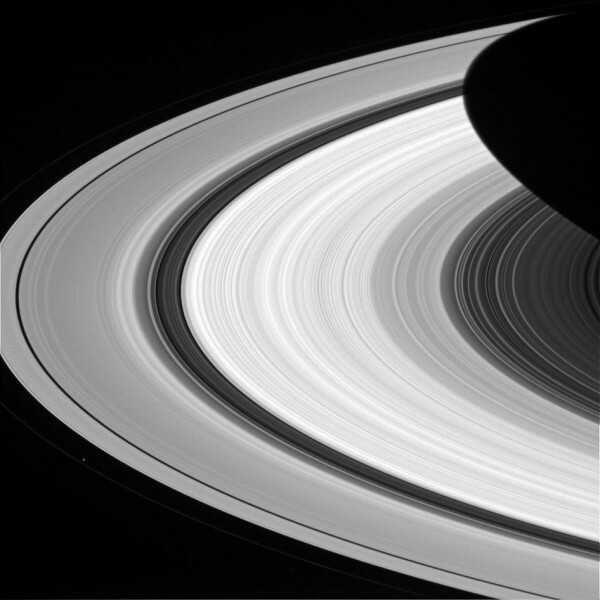 The dark gaps near the left edge of the A ring (the broad, outermost ring here) are caused by the moons (Pan and Daphnis) embedded in the gaps, while the wider Cassini division (dark area between the B ring and A ring here) is created by a resonance with the medium-sized moon Mimas (which orbits well outside the rings). Prometheus is seen orbiting just outside the A ring in the lower left quadrant of this image; the F ring can be faintly seen to the left of Prometheus.